In response to the highly flawed Lane Cove Bushfire Accessibility Report which has been slammed by Council, LCC have issued a poster which has started appearing throughout the suburb. 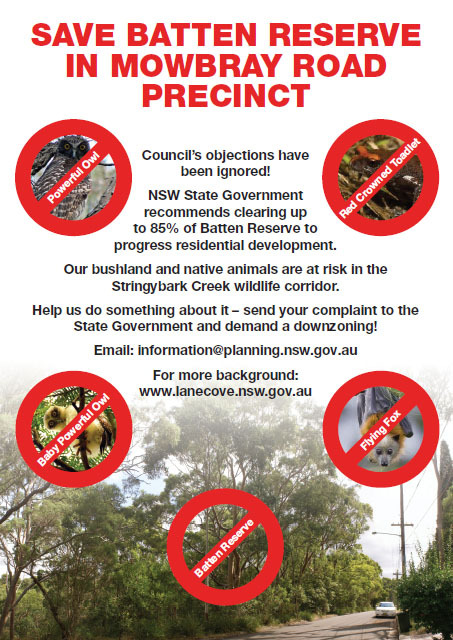 The poster highlights several animal species which are at risk should some of the recommendations within the report by acted upon, which includes clearing up to 85% of the tree canopy from Batten Reserve! The SBCRA are quite simply disgusted by such a recommendation and are doing all we can to ensure no such thing happens. Download a PDF version of the Poster and post it around your neighbourhood today!